T.W. Fisher is back in business with his new Midtown Pub. Tom Fisher goes by many monikers. He's "TW," or "TeeDub" to friends; he's also a real estate broker, owner of Coeur d'Alene's new Midtown Pub, and one of the original fathers of craft brewing in our region. In 1987, well before Laughing Dog Brewing's start in Sandpoint, or any other North Idaho breweries, Fisher created T.W. Fisher's Brewpub. The business housed Coeur d'Alene Brewing, which helped launch the brewing careers of people like Mark Irvin, the founder of Northern Lights Brewing Co., now known as No-Li Brewhouse. Just a year after opening, Coeur d'Alene Brewing's T.W. Fisher's Centennial Pale Ale won gold at the Great American Beer Festival. Fisher quickly expanded distribution well beyond Coeur d'Alene, to four additional states. And he'd created the place to go in downtown Coeur d'Alene, up until selling it in 2002. Although Fisher has built a successful real estate career over the years, he never abandoned the beer business. 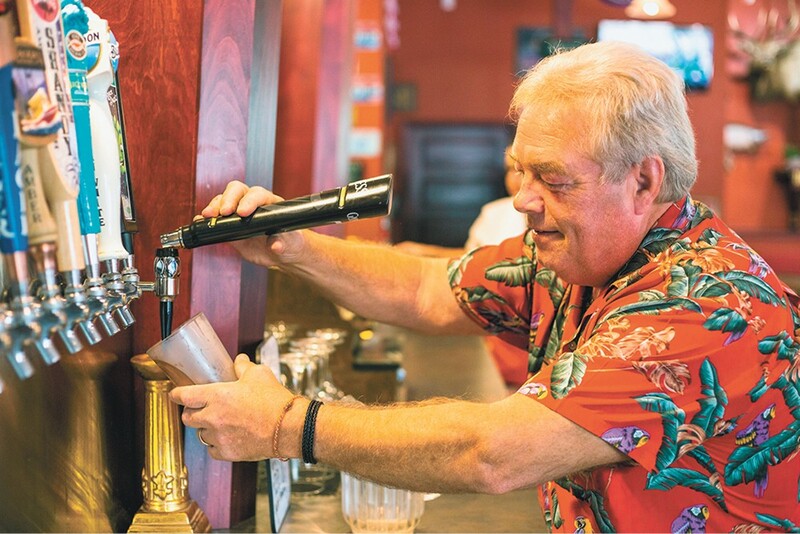 He held onto memorabilia — beer taps, serving trays, old signage — as well as his spot on the Idaho liquor license waiting list for both Post Falls and Coeur d'Alene. In 2012, when the Post Falls license became available, he opened Club 41 in the former Paddy's sports bar location, though he drew the ire of Coeur d'Alene Brewing's new owners when he tried to call the place T.W. Fisher's Club 41. Eventually Fisher sold Club 41, and Coeur d'Alene Brewing relocated to Spokane and became River City Brewing. Fisher also forgot about his Coeur d'Alene license application. Earlier this year — 30 years after he created T.W. Fisher's Brewpub — Fisher discovered he was next up for a liquor license. He purchased a building at the corner of Fourth and Montana, formerly home to a commercial cleaner, florist, deli and a 1950s pharmacy. He painted the building bright red, added black awnings, removed five layers of flooring, getting down to the original wood, and added a custom, turn-of-the-century-style wooden bar. He transformed old T.W. Fisher's signage into tabletops, lined a shelf along the ceiling with a portion of his collection of several hundred beer taps, and channeled a turn-of-the-century saloon feel to create Midtown Pub. For the modest menu of appetizers, salads and sandwiches, Fisher consulted with chef CJ Fox-Lopp, whose experience includes Daft Badger Brewing, Tony's on the Lake and the former Cellar in downtown Coeur d'Alene. Many dishes pay homage to Fisher's longstanding friendships in the community, such as Michael D's Pastrami sandwich, named for fellow restaurateur and Michael D's owner Michael DePasquale ($11). Also try the Midtown Madness, a variation on nachos made from potato chips, roasted pastrami, blue cheese and mozzarella, roasted peppers and Cajun mushrooms ($10/$13). Have a spinach salad with red onion, goat cheese and walnuts ($8), or share the Parmesan and cream cheese crab dip on a baguette ($10). In his trademark Hawaiian shirt, the affable Fisher is already thinking about what's next: Hanging plants, more outdoor seating, and helping to enhance the already popular midtown neighborhood. "No matter what I make, I spend a dollar more than I have," jokes Fisher, who at 65 has no plans to retire. Born and raised in Coeur d'Alene, Fisher has been working since he was a teenager, starting with several former downtown businesses — J.C. Penney, Harvey's Men's & Ladies store, First National Bank — then moving on to the Hagadone Corporation as circulation manager for 14 years. Now, he jokingly refers to the Midtown Pub as his second office, happy to be working doubly hard at both it and his real estate ventures.